Let us begin at the beginning, in the primordial stew, if you will. A sauce made from fresh tomato, zucchini, and canned tuna fish, cooked by the artist himself in 1998. It struck me then that while this was his first painting which had immediately to do with our reality, it wasn’t a simple still life, wasn’t about a hard stare at what’s in front of you. Instead I called it an icon as it guarded over what mattered in our lives: this sauce over spaghetti independently served as our staple food all through our student days. It must have been a spiritual thing, since it didn’t even taste good, none of us ever found out how to prepare it correctly, so the tuna tended to take on an awful wet cardboard texture. Still we cooked that sauce, again and again. The painting now sits on my bookshelf and stares me hard in the back of the neck as I write this. And here we should be reasonably close to the real beginning in art-historical terms. It’s a phalanx of small paintings which contain a lot of the formal explorations to follow while still being grounded in a small patch of home turf. These are Stadien from 2001 in an early playful hanging. The title translates as either arenas or as stages in a development. And truly these pieces contain several stages, most apparent a balancing of the representational versus the abstract that very systematically tackles right at the outset of Tim Eitel’s oeuvre a fundamental problem every painter has to find a stance on. The choice of a sports court feels obvious for that task, since it has straight and regularly curved lines painted on it—a utilitarian drawing from real life that can be balanced into a satisfying composition. Even in paintings that might seem to exist for purely formal reasons, we should at least take the time and check the subject for emotional content. So suppose these were sports courts in the life of the young artist, who wouldn’t take to ball games naturally. Out on the court, in his attempt to avert the gaze from active play so that his teammates would not pass him the ball, his eye would necessarily hit on these angles . . . I ask him if there’s anything to that and he says no. In one of the paintings, there is a fashion-conscious woman standing with her gaze directed toward the left edge, and another canvas sees a female figure partly outside the frame. The shadows they cast on the scene make it clear that they’re standing in front of a landscape painting within a painting. 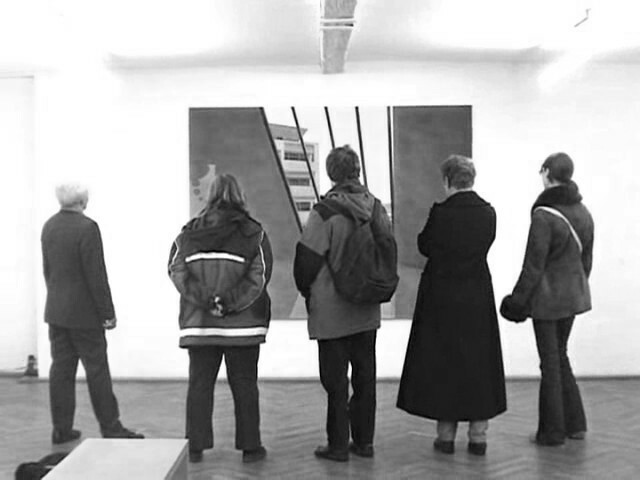 People gazing at paintings or at nature as if it were a painting, viewers striking poses as role models or model recipients, this kind of double play, with or without a single remove, was to become central over the next work period . 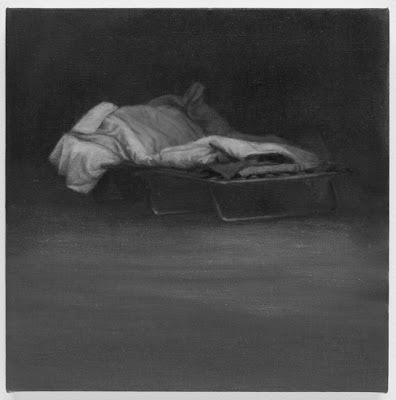 . . but the two paintings also reach out toward the present work: a boy in a fog bank, throwing a shadow unto the thick soup surrounding him, as if it were a picture he was considering to enter. I have what feels like a distinct recollection of staying in the artist’s studio at the old Leipzig cotton mill for a visit. I’m sure it’s a composite memory, patched together from different situations, still it’ll have to do: waking up very early as the light hit unrestrained through the huge windows of the old redbrick, I was lying on a mattress on the gray concrete floor—a smooth, unreal gray, since the artist had just painted over the traces of earlier occupants with a fresh coat of color. Somebody was up already practicing cello down the hall, sounding like a hangover from the relentless pounding of the downstairs club called Tangofabrik through most of the night. I looked up at a painting on the wall hit by yellow sunlight, there was the half figure of a young woman in profile, with her gaze directed toward the left edge of the canvas, and where as a backdrop I remembered there used to be sky and a landscape with trees and stuff when I’d last seen it yesterday, there now was something like a smooth concrete wall with a huge round window, inscribing the figure in a near perfect circle, and somehow the thought bothered me of the landscape buried beneath the clean outlines as I tried to go to sleep again. 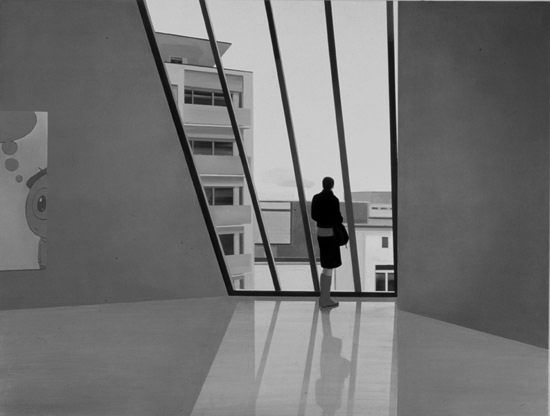 Now these were the two work groups at the heart of the oeuvre until the mid-decade: people viewing art within gallery spaces, inscribed into the dynamic of modernist architecture, or people out in recreational areas, as close to nature as one would get on a daytrip from urban civilization. The museum interiors felt absolutely spot-on, because it made immediate sense for the artist to explore the uses his paintings would serve at that early point in his career. So yes of course these would become commodity objects for the white cube (within that strangely apart system, the art world, that strangely allows an artist to do great work both for and against it), and they would become respectable carriers of cultural tropes hanging on museum walls. Both his own paintings or classics from Mondrian to Murakami made their cameos, and the painted viewers measuring up to them brought their own self-conscious pose into the painted exhibition space, and the resulting confrontation made both parties look good. 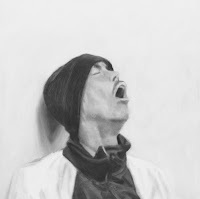 The spaces could become quite close, though, the paintings quite dark, especially when there were no discernible artworks to fix the gaze and the museum architecture became a tailor-made enclosement of the pictured viewer frozen in the futile defense of a doubtful gesture. The full impact of these paintings could of course only be experienced in an actual exhibition situation, when the real-life viewer was all but forced to relate to the posturing on view. 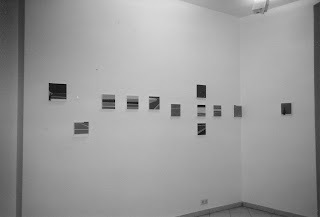 Here are two snapshots I took at the solo exhibition in Backnang in 2005. The first reaction you see is imitation (the woman mimicking the pose in the painting was by the way not talking about the art, while she drew the sleeves halfway over her hands instinctively feeling cold for the bathing figure behind her). 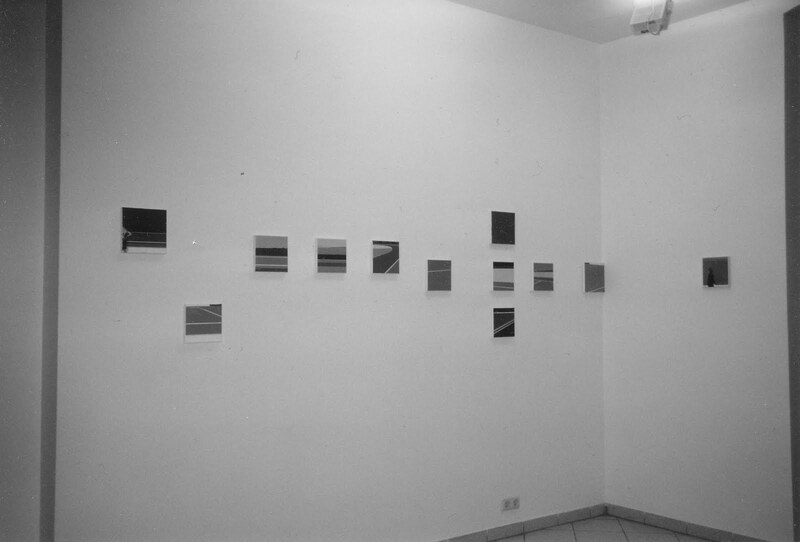 The second photo shows the self-consciousnesses of a whole catalog of viewers side by side, trying to emulate the reflective pose of the protagonist on the picture itself. Here the classic back figure, which we know so well especially from romantic paintings—and Caspar David Friedrich has often been cited as a main influence on the artist—is extended into the room by the viewer, of course referencing the pretty sorry tradition of installation photographs that show the work with a viewer in front of it to gain a sense of proportion and not make the artwork look quite so lonely. Of course I do not know how a contemporary viewer would really have felt facing the back of a figure in a Caspar David Friedrich painting; today at least these have aged less well than the landscape in front of them. Maybe it’s just the clothing, but these back figures are hard to identify with, instead I’d rather elbow them out of the way because they stand between myself and the (sublime) subject. I may be aware that the figure does the same thing as me, staring at nature in more or less wonderment, but the distance in time and fashion has become so great that it doesn’t make me empathetically self-aware. The fact that I find it much easier to identify with Tim Eitel’s paintings, no matter if they take place in nature or a museum, may be because they depict people just like me. But then it also may be that they in return identify with me more closely. You will probably know Friedrich’s Wanderer Above The Sea Of Fog, an arrogant fop standing on a boulder looking down on ridges drowned in clouds, all lofty aspirations, and if you want to read uncertainty of fate into that master figure (as is usually done), you have to paint both man and nature as two superheroic forces holding each other in deadlock. So when we went out into the countryside, as far as daytrip would take us, we went there to view nature as if it were art. So estranged were we that we managed to consume what we were supposed to be part of in the first place, be it art, or nature. 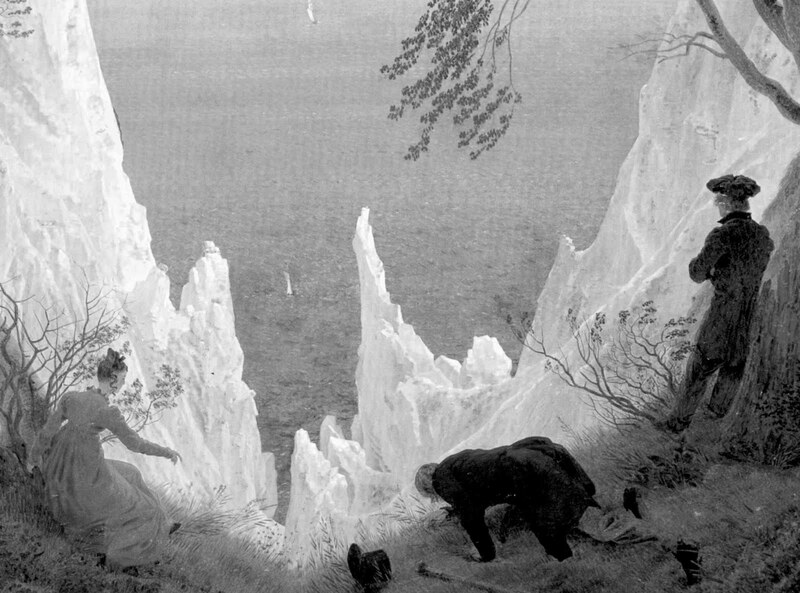 We were not scrambling about as the figures in Friedrich’s Rügen, that satire on mass tourism, but kept our distance, not out of awe, more out of an awkward sense that the pose would not resonate as in more accustomed surroundings. Landscape is a huge topic, and a painter will have to compete against, say, both a Ruysdael, who portrayed the gnarly souls of trees, and a Gainsborough, who painted deliciously feathery brushes straight out of landscape gardening. Today, the backdrop has receded even farther. 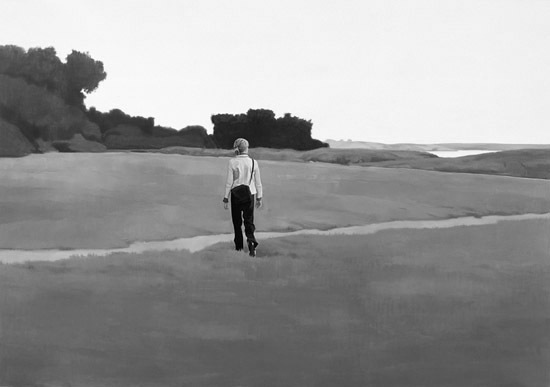 The woman in Abend from 2003, after she has overstepped the sand trail that marks the visual borderline between foreground and distance, will still remain a tourist in her own painting. While the artist takes us as far as we’re willing to go, there can be no beyond within that line of questioning. It’s a privilege of close familiarity with an artist that you get to root for them and feel emotionally involved in every step of their development. You start guessing what’s up next, and will they hit the exact point when they need to come up with something new, or will they have to tread water until a pathbreaking idea finally materializes. Will the next exhibition reveal a luminous masterpiece, or will you have to apply your utmost connoisseurship to dig up the hidden qualities within the art to save face in front of anyone who knows that you somehow care. When the artist went to the U.S. in 2005, first to L.A., then New York, I of course had placed my bets on how L.A.’s sunny, car-driven culture and New York’s picturebook metropolism must surely affect the painting (I’ve never been to these places, so I have to operate on suchlike clichés, I’m afraid). 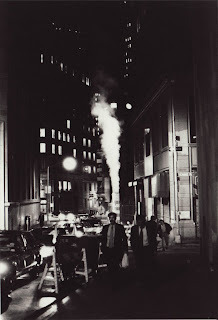 Just see these photos the artist as a young man took on a tourist trip to New York: the city looked like film noir and early Jarmusch alright. In retrospect I notice that I’ve constructed a very pat narrative, where everything fits a little too well together, grounded just firmly enough in something resembling reality that I can’t help doing it. The storyline runs like this: as soon as the artist arrived at the West Coast, his paintings became all dark gray and muddy, like he was overcompensating beach life through some extra heavy interior sunglasses. And when the artist settled in New York in 2006 (here a view from his studio window that, mostly due to the bridge, meets all my expectancies for a stylish locale there), it felt like his subject matter would change completely. He produced some large canvases that leant themselves to metaphor, showing detachments of people in environments whose level of abstraction seemed potentially hostile. And then there were pictures almost as blunt in topic as they were shadowy in treatment, of homeless people or still lifes of their belongings on shopping carts, all in shades of gray so dull they sucked the light out of any exhibition space. When I see Rauch from 2006, my first reaction is to fondly remember how I read Jules Verne as a child. Verne’s calculated and rather pedantic sense of wonder taught me how to build something concrete out of the unruly figments of imagination. Even if that concrete thing might not be as sublime as originally projected, at least it now existed. Here, it’s the writer’s Journey to the Center of the Earth that the figures seem to fit into, when they’re traveling through cathedral-like caves made of thick smoke over a flat ground. Shrunk and sent on a fantastic voyage into their inner selves. These are just associations that I have, and not intended references on the artist’s part, but anyway, it is this kind of narrative space that opens up—running deeper than the media imagery of explosions and other catastrophes that you might associate with the smoke formations—when you try to decipher the gray ground in the paintings of this period. The gray isolates the anecdotal evidence appearing within, framing it, and attributing it special import. 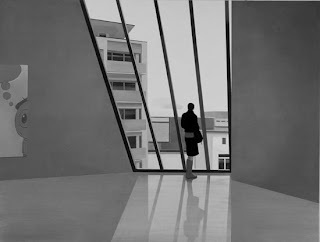 As we’ve seen, earlier figures tended to be isolated by abstract lines and planes that could have happened in real-life spaces, which meant a sort of home to them. But here in the smoke, there is nothing outside, all is concentration along the one sightline, a single, possibly inward view. 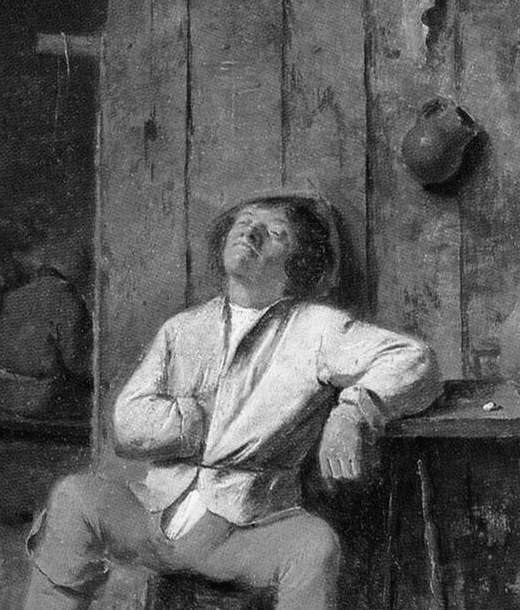 As these figures do not have an aestheticized arrangement of lines and planes to call a home, and they do not find themselves anchored within the socializing context of a clever composition, they instead become the sole focal points of their paintings, worlds unto themselves, their own centers of gravity, attracting discarded movable property. Their energy, though, makes that the pictures are not completely dark, there is some warmth, even tenderness. It all happens in the safety of the studio (now set up in Paris), a laboratory for flattening the world ideally in a way that seems to add an extra dimension. So could this be an exploitation art, in the same way that painters have used the graphic violence of Christian mythology or the sensual thrill of perfumed exoticism? I’d say no, since the art will not use the individual subject as material for metaphor, or as an ornament in formalism, but instead it is an art about that individual, in and out of the picture. You must believe in painting for this. You must believe in some sort of transfiguration taking place on the canvas. What that transfiguration might be, apart from the work involved and the skill and focus, is not easy to define. A simple camping bed can become pregnant with meaning when it is painted. Is that too easy an achievement? The outcome indeed depends on the layers of meaning hidden in the object itself (as it does in object art based on the readymade). The most loaded subject of course is the human figure, but it also can be the most meaningless if it only suggests a vague “us” as a species. Then again, even when we can’t sufficiently read the figure’s alignments or its individuality, the surroundings might still offer it up as a placeholder for our own sensibilities. 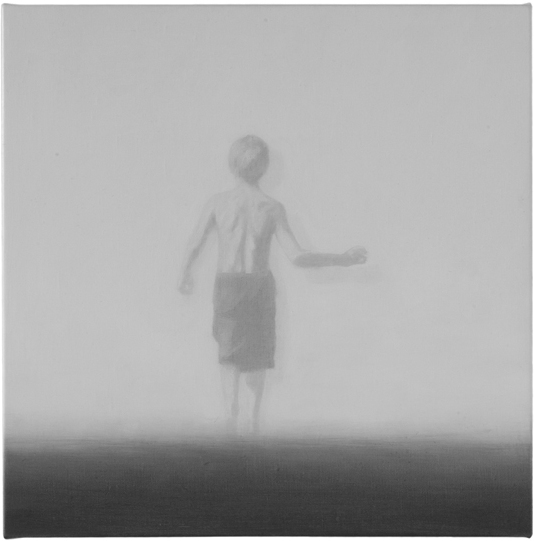 That is what most of Tim Eitel’s larger gray paintings do. The small canvases, on the other hand, often get quite close to the subject, sometimes approaching the anecdotal in the process, projecting somebody to identify with. Of course identification in art is different from the narrative media, like film: there are no role models, a painting will mostly offer a gesture or expression that has immediacy and a surprising similarity to whatever the viewer will bring to the picture with a desire for it to be completed. The process is subjective and mood-dependent, yet it has to do with truthfulness of depiction.